Our youngest Princess will be celebrating her seventh birthday in a few days... this is a very special year in our family! 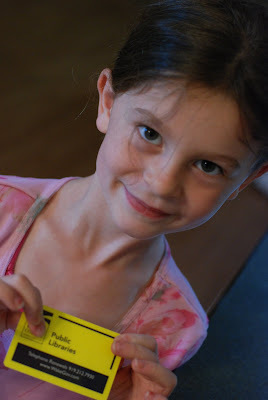 When each child turns seven have a tradition that that is the "magical" number for becoming a big kid and having the whole world open at their fingertips... this is when they get to get their very own library card!!! We made the trip to the home of new adventures (library) and this new right of passage began for this little girl! Why age seven you ask?!? Because it seems that right around this age the love of reading really appears. I am always on the lookout for this special transformation in each of my children and with them it has been a specific book or series in our case! With our eldest it was The Nancy Drew Notebooks... she devoured them all in only a few weeks and quickly moved on to another series, and then another. With this little princess though I was fearful, she is not the "sit down and read type" if you know what I mean. 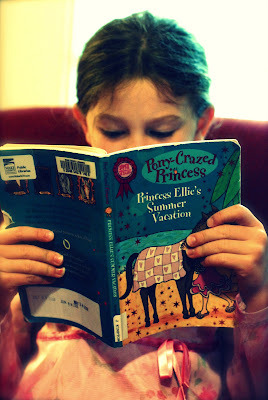 I tried EVERYTHING to find that special book that would magically transform her world as it did for her sister. This little girl loves books... but not to read on her own, though she KNOWS how to read! About a week ago my oldest daughter and I were on a mommy/daughter date and she wanted to go to the library so off we went. While there, I stumbled upon yet another series of books that I knew my middle child would love so I attempted to give it another try and yup the transformation came! Its funny but I see this time very similar as a scene from Harry Potter when his wand "picks" him..
A very happy birthday to your little princess and congratulations to the parents! Our oldest turns seven at the end of June and I was trying to think of something special - BINGO - his own library card will be perfect. Thanks again TM! I have found the same truth about books and children! It's a beautiful thing! I read quite a few old posts. I love this blog! You seem like such a sweet person. I wish I could sew--I love skirts as well. My husband (a Christian)likes skirts to be on the shorter side. I don't think he would like them "Little House on the Prairie" length. Does that make him carnal--or is it consistent with how God designed him? I wish I knew. It would help me make feminine clothing choices that would please both my husband and my God. It is confusing. What is your take on this? Beautiful posts. It brought me back- The Nancy Drew series was one of my fav's.